RELATED: Watch a video of the center's programs by clicking here. WEST COLUMBIA, SC -- It was a time to celebrate this week, as the state-of-the-art Lexington Two Innovation Center was formally dedicated. Innovation Center families, educators, business and community leaders, school board members, district administrators and others turned out December 11 for a reception and tours of the two-story, 110,000-square-foot facility. Among featured speakers were State Sen. Nikki Setzler and Cayce Mayor Elise Partin. “This facility, this Innovation Center, is incredible,” said Setzler, a graduate of Lexington Two schools whose family has strong ties to the district. The senator noted that Lexington Two’s college and career programs at the new center offer an opportunity not only in turning out graduates ready to work in businesses already here but to draw new industry to the area. Students in the Culinary Arts program, under the direction of instructor and Chef Isaac Pressley, prepared a sampling of foods including barbecue sliders, egg rolls, and teriyaki chicken skewers with dipping sauces. 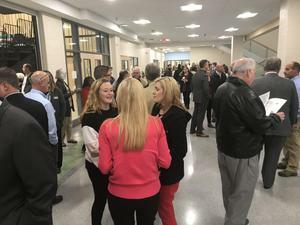 The Innovation Center is the third new school to open as part of a $225 million package of improvements approved by Lexington Two voters in 2014. Construction work is under way on the final phase of the project, which includes upgrades to all of the district’s schools serving Cayce, Pine Ridge, South Congaree, Springdale and West Columbia. Superintendent Dr. William James Jr. lauded the opportunities the Innovation Center will bring to Lexington Two students, whether they’re there to attend dual placement courses for college credit or to work toward professional certification upon graduation. Mayor Partin noted the excitement about the center -- and the excitement for learning -- as guests entered for dedication events. “Thank you for creating a place that will bless the next generation,” Partin said.